I know you don’t read this blog for tips on how to be a wonderful Christian parent. I AM ABSOLUTELY CLUELESS WHEN IT COMES TO GUIDING MY CHILDREN IN PRAYER. There. I’ve said it. Pass the G ‘n’ T and a paper bag please. It doesn’t help that our main time for prayer here at Casa Desert is at bedtime, when the kids are past tired. Do you know what happens when my kids get tired? They don’t go to sleep, or at least pipe down – oh no! Haha. As if. That would be normal, predictable children you’re thinking of. And those children don’t live in my house. No. The children God is using to teach me enormous amounts of patience DO NOT DO PIPING DOWN. When they get tired their brains tell them to start a game of Bunk Bed Olympics or have a Rude Noise Contest. And this, friends, is the backdrop to laying all our petitions and requests before God, with thanksgiving, leaving space so we can learn to hear His voice too. I tell you, St Paul had no idea. It is these times that my children will look back on with fondness, these times that my son will include in his groom’s speech, thanking us for instilling him with such a deep and fulfilling prayer life. Ummm. Anyway, it’s clear that I/we need some help on this one. 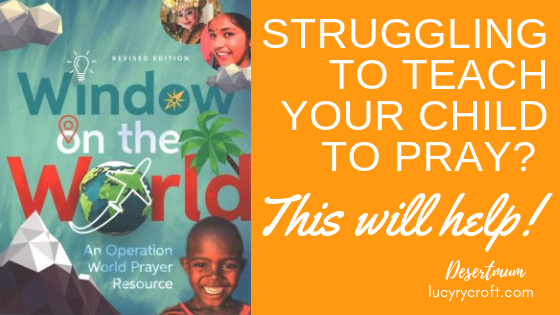 Cue: Window on the World: a fantastic resource to get your kids knowledgeable about, and excited to pray for, a variety of different countries. When I heard about this resource, I knew it was something our family needed. At the best of times our prayers tend to focus on thanking God for what He’s given us, and praying for situations at school. There’s nothing wrong with this of course – in fact, learning to share our lives and worries with God is an essential part of learning to pray. But praying like this doesn’t teach us to look outside of ourselves. Our kids lead sheltered lives, and they don’t know a huge amount about what’s happening around the world. Yet you’ve seen what our bedtimes are like – trying to get the kids to think more widely at this time of day, when they haven’t got any knowledge to go on, is near impossible. 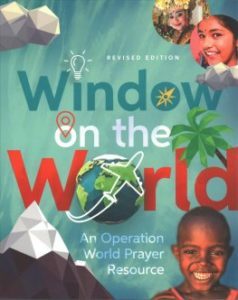 Window on the World has been authored by Molly Wall and Jason Mandryk of Operation World, the organisation which researches every country in the world in order to put together an accurate, fact-filled guide for prayer, once every ten years. I love that they’ve produced something that is aimed at children, for all the reasons mentioned above. And it’s really great. 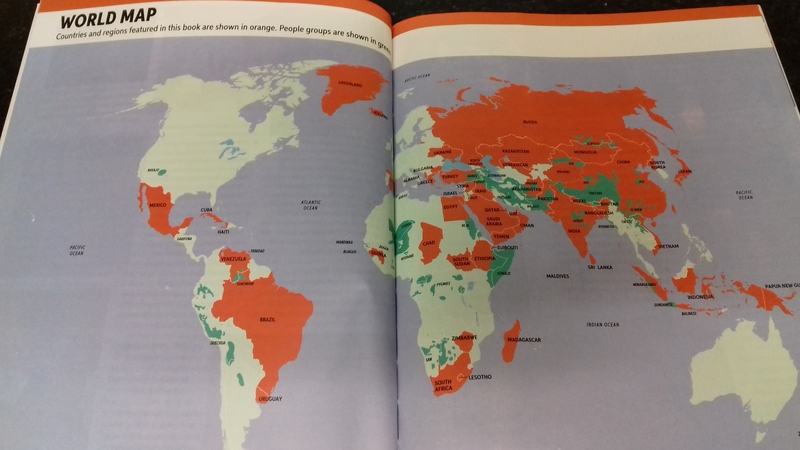 There’s a double page spread on 92 different countries and people groups, containing stories, colour photos, facts and – of course – prayer points for each country. The facts cover religion, recent history, church growth, geography and any particular challenges for that country. 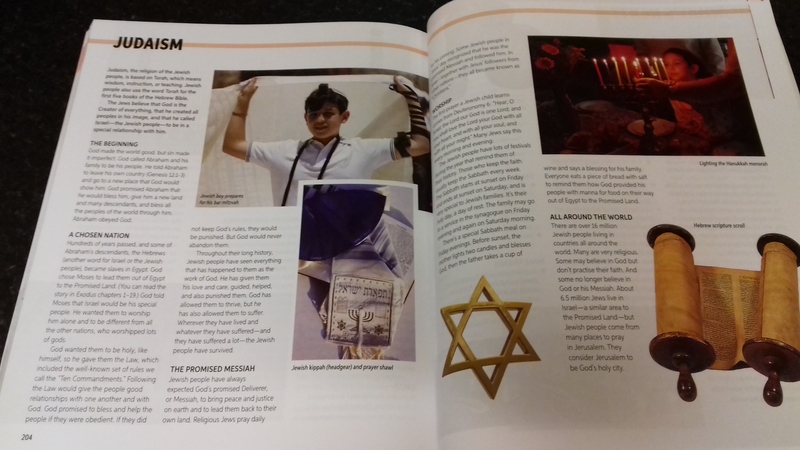 There are more detailed pages at the back of the book covering the main world religions, for children who want to delve further. We started with Ethiopia, as we have friends there, and our kids enjoyed learning how long Christianity had been around in Ethiopia, and the fact that the first African to win an Olympic gold was Ethiopian! On week two, we focused on India, as another friend is working there at the moment. 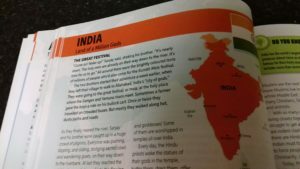 We learnt about the caste system, and Dalits, and – despite their protests to the contrary – how our kids are really, really lucky to go to school and not have to go to work. 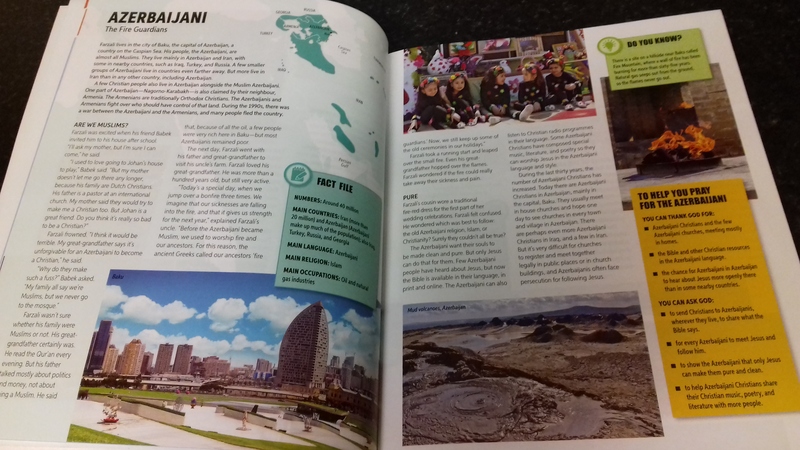 This week – for no reason other than they liked the name (I told you my kids were holy) – we’re learning about Azerbaijan, including some of the interesting Islamic customs and traditions they have, and the friction between different religions. Each week, as we’ve shared a few stories or facts, we’ve been able to absorb the prayer points into our bedtime prayers. They’ve been nearer the front of our minds, so it doesn’t matter that we’re tired and jumping off top bunks, because we’ve done the learning and thinking earlier in the day. Our children have particularly appreciated the large number of stories in the book, which are largely about children, and save it from becoming too textbook-like. These have grabbed our children’s imaginations, and helped to explain an important point about that country’s culture or religion. From a missional point of view – and, as you’d expect, coming from a trusted and experienced organisation like Operation World – the text is sympathetic and nuanced, with no hint of imperialism or cultural arrogance. It is, however, clearly evangelical, and children are encouraged to spot the differences between Christianity and other religions, as well as pray for evangelism and discipleship in the various different countries. The resource can be used – albeit in different ways – with a very wide range of ages. We’re using it with our 4 year olds, who are engaged and asking for more, and my brother is using it with his 15- and 14-year old sons, who can read and absorb more of the information. 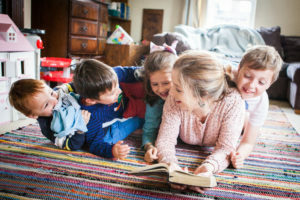 It’s great for mixed-age families, and for this I’m grateful, because we usually have to split our time, using one resource with our twins and another with our older two. Not so with Window on the World: all four children have been interested and actively engaged. 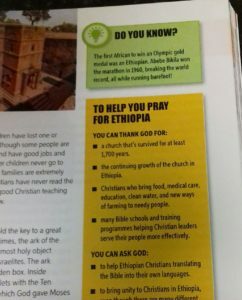 This would work really well as a children’s church resource too, focusing on a different country each month, or honing in on countries where your church has link missionaries or other connections. You can buy the book here – but, as it’s Giveaway Month here on the blog, I’m so excited to be able to offer one lucky reader a free copy of this amazing book for their family or children’s group! It would make a wonderful, long-lasting Christmas present too – imagine the impact of spending 2019 learning about, and praying for, different people groups around the world? To enter, simply sign up to my mailing list (you’ll also be one of the first to get my brand-new and FREE e-book: ’15 spiritual practices every tired parent needs to know’!) – if you’re already signed up, then simply comment below and you’ll be entered. The deadline is Sunday 25th November, 8pm GMT – and yes, I will post internationally. Thanks sis, awesome review. As the brother in question, with our teenage boys we naturally use it differently, reading each article right through in one sitting at Sunday teatimes. I agree it’s good to start with countries you have a connection to: in our case, Japan and Albania. And then countries of particular concern, eg Iraq and North Korea, or in the news, like Saudi Arabia and Turkey. Whatever it takes to get our prayer juices flowing, let’s do it! Would love to win one of these, but may have to go and buy one anyway because I can think of so many people I’d love to give this to! Yes please! We definitely use some inspiration for bedtime prayers! Looks brilliant. I had a version as a child and it was great for opening my eyes to other countries in a personalised way.